A few weeks back I mentioned a great site, gpotato.com for free MMOs. Normally I'm heavily into the RPGs if I'm to play an MMO, but I gave this game a shot. Tales Runner is a racing MMO where you chose characters to play from a few different choices. I would have loved to have a few more options on character customization from the start, but later on the outfit customization opens up quite a bit. Really this game felt like one big excuse to shop. Hair accessories, outfits, shoes, and an insane amount of costume ideas are all out there for the buying, either with game money or real money to buy credits for purchases. It would seem the game's main focus is customization. I guess in a sense most games inject some level of customization for your character to be able to progress, but I just didn't feel like I needed more outfits to get further in the game. The controls are very simple, a few things to do with the mouse and the rest is easily accessed on the left of the keyboard. You run, jump, run, dodge, run, ski, run, swim, and run some more. There sure is a lot of running in Tales Runner! There are a number of game modes from individual races, all the way up to racing against large groups. Other modes include relays, team races, or even just trying to be the last to survive in a complex race. Some races even challenge the mind by making you do math. A recent patch opened up some interesting features where you can build your own farm area to customize. You can invite your friends to see things you've won or bought in the game or you can check out their farms. Another excuse to go shopping! Even with a really nice community, I just couldn't get into this game. The graphics are decent, there are many interesting features and it's a unique twist on racing - just not my cup of tea. I will say though, it's a free game to play and you can meet lots of interesting people. 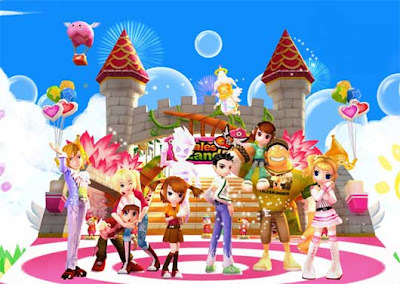 Additionally, if you like to play dress-up with cute looking avatars, run around a lot and make your own little space to show off...which so many people enjoy doing, then you'll probably like enjoy this game!